In 1997, he authored the highly successful, See It & Sink It instruction book. Recently, his latest book, The Putting Prescription, The Putt Doctor’s Proven Method for a Better Stroke (2009), was chosen one of the “Top 25 All-Time Golf Instruction Books” by a 2009 Internet survey. In 2011, he was selected as one of the Top 20, short-game instructors, by an independent group. In 2010, he was selected as one of “The Brightest Minds in Putting” in Golf Magazine’s The Best Putting Instruction Book Ever! Dr. Farnsworth is a Level III, certified AimPoint instructor. A featured presenter at the 2000 PGA Teaching & Coaching Summit in the New Orleans Superdome, Dr. Farnsworth became the first optometrist to speak at the Summit. He has been a featured instructor on Academy Live and Viewers Forum on The Golf Channel. He has presented his approach to putting to the Jim McLean Golf School, Nicklaus-Flick Golf School Instructors, Phil Ritson Golf Schools and to the David Ledbetter Junior Academy Instructors. He has presented workshops to the PGA sections of Minnesota, Illinois, Wisconsin, Indiana, Southern California, Southwest Florida, New Jersey, Montana, Idaho, Colorado, Mid-Atlantic, Pacific Northwest Section, Sierra Nevada and Nebraska. In August 2012, Dr. Farnsworth presented an all-day workshop on putting to the Great Britain & Ireland PGA section at The Belfry, Birmingham, England. Dr. Farnsworth also presented an all-day workshop to members of the Belgium PGA, in Brussels, in August, 2012. 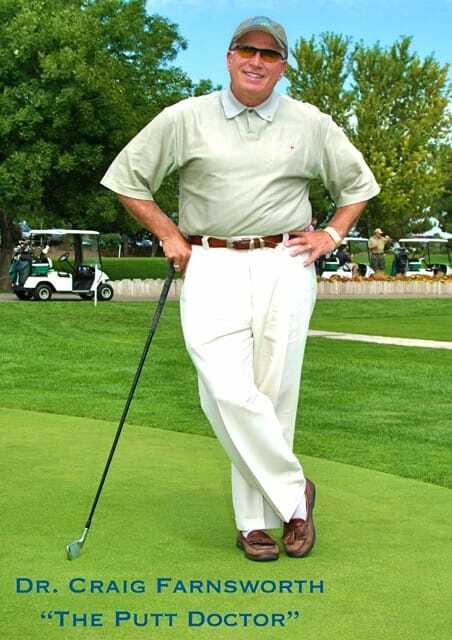 He has conducted clinics on putting and concentration to golf and country clubs such as Medinah, Riviera, Cherry Hills, Congressional, Manhattan Woods, Olympic Club, Pumpkin Ridge, Ocean Reef, Wynstone, Pelican Hill, Country Club of the Rockies, Barrington Hills, Castle Pines, Scarsdale, Colonial, Golf Club of Tennessee, Friars Head, Nantucket, Red Sky Ranch and Sleepy Hollow. In 2012, he conducted clinics in the UK, Belgium and Ireland as well as the Royal Navy Golf team. Has worked with over on 150 LPGA, Senior PGA and PGA players, including Nick Faldo, Brad Faxon, Annika Sorenstam, Bernhard Langer, Y.E. Yang, Steve Elkington, Juli Inkster, Rory McIlroy, Russell Knox, Beth Daniel, Seri Pak, Grace Park, So Yeon Ryu (2011 U.S. Women’s Open winner), David Toms, Jhonattan Vegas, Brian Gay, Scott McCarron, Jamie Lovemark, Carin Koch, Grace Park, Bob Charles, Isao Aoki, Jay Sigel, Chip Beck, J.J. Henry, Tom Purtzer, Steve Lowery, Gary McCord, 82 year-old Jack Fleck (1955 U.S. Open winner) and many others. ​Dr. Farnsworth’s work has been mentioned in magazines and periodicals that include GQ, Sports Illustrated, Golf, Golf Digest, Prevention, Golf for Women, Avid Golfer, Golf Illustrated, Colorado Golf and Golf Tips. In 1999, he was the American Optometric Association Sports Vision Optometrist of the Year. In 2005, Dr. Farnsworth was elected into his Indiana high school Athletic Hall of Fame. In 2016, he became certified as a Blast Motion putting instructor.